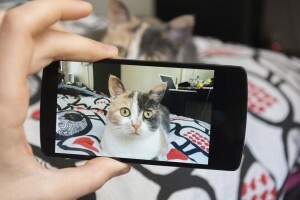 Either way, you definitely want to take the best possible pictures of your pet, and the pet experts at Elmhurst Animal Care Center are here to help. Perhaps your pet just returned from a grooming session and looks extra spiffy or you want to show off the pearly whites after a good tooth brushing. Whatever the reason, the most important thing to remember when taking pictures of your pet is his or her personality. You want to capture the essence of your pet. Whether he or she is young and playful or a distinguished senior, finding the right moment to highlight his or her unique qualities is critical to a successful photograph. Your pet may have a special or amusing ability, but every time you get ready to snap a picture, you find that he or she has already moved on. What to do? It’s best to try and catch your pet unawares. Say, for example, you’re trying to capture the expression your pet makes when he or she smells something funny. Try setting the stage by placing a funny-smelling item near you (and your camera) and call your pet over. Adjust your camera to a burst mode that allows numerous photos to be taken in quick succession. Your pet is at his or her best when playing and just doing whatever makes life great (digging, jumping, cuddling, etc.). Taking pictures of your pet is the most fun when you simply allow your pet to behave naturally. Snap away, and he or she won’t even notice! Outdoor lighting or setting up near a window will allow for a more colorful, dynamic shot. Just make sure to focus on his or her face! This is probably the most challenging photo shoot of all, mostly because your pet may not feel like sitting still. After considering the context, background, and lighting (beware the flash feature), you’ll need to work quickly to capture the right expression or moment. If a posed picture involves your pet wearing a certain costume or outfit, please make sure he or she is safe and comfortable. Free your pet at once if he or she shows discomfort or stress. Taking pictures of your pet provides endless opportunities to mix up your perspective. Get down on your pet’s level to learn more about how he or she sees the world. Zoom in closely to your pet’s snuggly face to eliminate background distractions. Use your imagination, and just like your sweet pet, embrace your playful side. Taking pictures of your pet is a wonderful hobby, and the hundreds of photos you’ll end up with provide beautiful proof that your pet is your best buddy. The pet experts at Elmhurst Animal Care Center invite you to post your pictures on our website. Also contact us if you’d like to get involved taking pictures of adoptable pets!